August 8, 2016 – This week, our time machine whisks us back to meet the great master, Michelangelo: Sculptor, painter, architect, poet, and engineer. He was also the original brooding artist, who for the first time connected the artist to the work, a link we consider essential today. 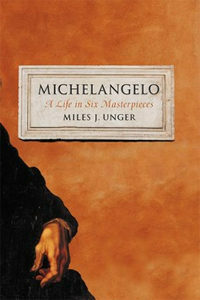 Our guide is Miles J. Unger, here to explore what the great artist is whispering to us across the centuries with his new book, Michelangelo: A Life in Six Masterpieces . The title calls this great master down from his Renaissance perch on the scaffold and brings him to a more human level, so we can better understand his genius through: the Pietà, the Last Judgment, the David, the Medici tombs, the story of Creation on the Sistine Chapel ceiling, and the soaring dome and vaults of St. Peter’s Basilica. Miles J. Unger currently writes for the Economist, and lived in Florence for five years, deepening his knowledge of Italian culture and language. He also served as Managing Editor of Art New England, and has published in numerous other places including the New York Times. You can learn more about him at Miles J. Unger.com — that’s Miles, the letter J, Unger Dot Com — or by tossing a like to his Facebook.